The country is benefiting from rebounding commodity prices in its key exports, such as iron ore and coal, with China and India predicted to continue fueling strong demand in the future.....They [IMF economists] also recommend saving revenue windfalls, which would build a buffer against any sharp fall in commodity prices and permit those automatic stabilizers to operate during downturns. 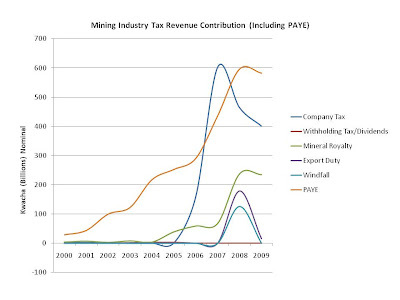 The economists also welcomed the planned introduction of a mineral resource rent tax as “a step in the right direction.” Tax reform could play a key role in allowing Australia to reallocate resources to the mining sector, and to take full advantage of the mining boom. 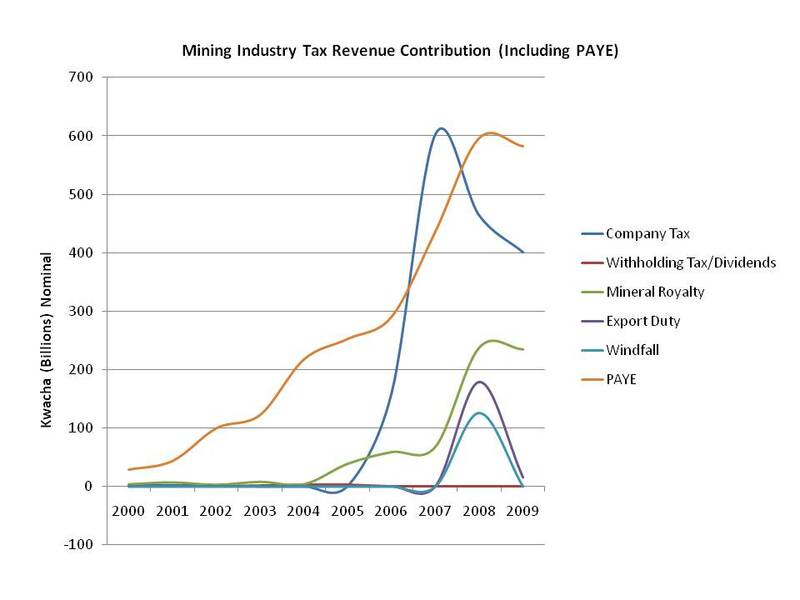 They recommend that the new minerals tax could be broadened to cover other mineral resources beyond iron ore and coal. Excerpt from the IMF summary on Australia's 2010 Article IV Consultation—Staff Report. The IMF praise for Australia's higher taxation proposals (trailed here) is interesting. No only do they welcome it, but they ask that these taxes are "broadened" to cover other minerals. In paragraphs 52 to 61 of the report of the Auditor General for 2005 on the accounts of Parastatal bodies, mention was made of the non declaration of dividends and non payment of taxes by the Corporation due to its poor financial performance. Mention was also made of the poor liquidity position, increased cost of borrowing, irregular payment of Christmas bonuses, outstanding pensions and failure to follow tender procedures among others. Have things improved? No. It appears NACL continues to be a poorly run organisation whose position regresses with every AG report. "It was observed that although the Corporation recorded profits in the financial year ending 31st March 2006 and 2008, losses of K3.77 billion and K16.05 billion were incurred in 2007 and 2009 respectively". Forty nine (49) payment vouchers in amounts totalling K241,442,834 and four (4) payment vouchers in amounts totalling US$16,308.28 were inadequately supported in that they lacked receipts, acquittal sheets or other supporting documents. A physical verification of the civil works carried out in August 2009, revealed that construction works had stalled as shown in the picture below and the contractor was not on site. To be aware that in line with established practice, I shall again be taking my break from blogging between 1st - 31st December. The annual break from blogging is a long time tradition which allows me to recharge my batteries and take a step back and focus on other areas of my life. What this will mean in practice is that no new posts will be published between that period. 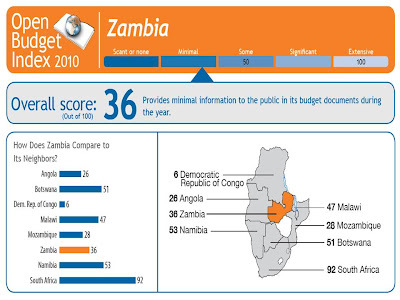 A number of you have asked on the status on the Zambian Elections 2011 Project. Unfortunately, it wont be possible to take forward the idea in its original conception. Although I received interesting proposals for papers (10 - 15 credible proposals), it is likely to be resource intensive (despite the delusions of some that this is a sort of political project, this website is only an hobby. I do actually have a real job, a family, a church and other areas of service). So I did ask myself whether such a project would require scaling back on other things. The answer was Yes, and the sacrifice proved too great - under the original conception. I do think though we need a dedicate election website (during the three months of election campaigns) and we shall use that website in 2011, 2016 and beyond. It will be an independent source of relevant news, catalogue of promises, profile of candidates, election results, etc. Since the last update, I have been able to read two additional books. First, I picked up a little biography of William Duma (1907 - 1977), Take Your Glory Lord by Mary Garnet. Duma was one of the most dynamic Baptist preachers in South Africa. When Duma died in 1977 he left behind a vibrant legacy. He had been the Moderator of the Baptist Convention (for black Baptist ministers), his work had been recognized by Christians all over southern Africa, yet he remained a humble servant of God to whom he attributed the success of his work. The other book I picked up was Forgotten God by Francis Chan. It examines the tragic neglect of the Holy Spirit in the church today. I picked up this book after listening to the introduction via a free audio version. How do the books I have read so far break down? We are a little low on "Zambia / Africa" related literature. Will be looking to up that in the remaining weeks, if possible! Zambians suffer from extremely poor health. They have the third lowest life expectancy, when adjusted for healthy years lived, of 35 years. A high 10% of children die before their first birthday and more than four in 10 people are malnourished. Only 80% of children receive vaccinations for infectious diseases and just 85% are immunised against measles, placing Zambia in the bottom quarter of the Index. Health expenditure is the 10th lowest on the Index at just $85 (PPP) per capita. Only half of the population has access to adequate waste disposal facilities and just 55% of people are satisfied with the quality of their water. There is a below average supply of hospital beds. Zambia places in the bottom 10 on the Index for the exceptionally high incidence rate of TB and also the high number of deaths caused by respiratory diseases. Zambians do not feel very healthy: according to a 2008 survey, fewer than eight in 10 Zambians express satisfaction with their level of personal health, placing the country 72nd. Less than two-thirds felt well-rested on the previous day and more than a quarter reported health problems that affected their daily life. In the early days of the global financial crisis, there was some optimism that developing countries would avoid the downturn that advanced industrial countries experienced. After all, this time it was not they that had engaged in financial excess, and their economic fundamentals looked strong. But these hopes were dashed as international lending dried up and trade collapsed, sending developing countries down the same spiral that industrial nations took. But international trade and finance have both revived, and now we hear an even more ambitious version of the scenario. Developing countries, it is said, are headed for strong growth, regardless of the doom and gloom that has returned to Europe and the United States. More strikingly, many now expect the developing world to become the growth engine of the global economy. Otaviano Canuto, a World Bank vice president, and his collaborators have just produced a long report that makes the case for this optimistic prognosis. When construction of the M’cheleka dam wall was completed in 2000, Hastings Mbuzi and hundreds of other villagers in Chadiza thought they would soon be rich. They would no longer need to travel long distances to other parts of the province to buy food....But the dam filled with water and then stood there, unused. The villagers waited patiently, hoping something could be done. In September 2008, it seemed a breakthrough had been achieved when the government released 190 million Zambian kwacha (about $40,000) for the completion of the project....But two years later, a report from the Office of the Auditor General (OAG) shows that while money released through the District Agriculture Coordinating Office in September 2008, and documents show it was all spent, the project on the ground remained uncompleted. Extract from an IPS piece on the colossal failure of the M'cheleka Irrigation Scheme to benefit the poor. In the words of one Mbuzi, "All we know is that the money was released to the district agricultural officials to purchase material for the construction of the canals". We stop over at a newly constructed market shelter. The market was built by the former mining giant ZCCM. There is also a community library which lies empty and a play park for children. But the market shelter, which has 24 stands, only has five old women trading there. The oldest of them is 74-year-old Stellia Jere. Stellia had 10 children, but they have all died. The last one died in June. She now takes care of five of her grandchildren. “Most of the people prefer trading from the streets in town, but I don’t have the strength to run away from the council police,” she says when I enquire about the empty stands. Excerpt from another excellent piece by Jack Zimba - Living on less than a dollar a day. It paints a harrowing picture 46 years after independence. Readers will be familiar with my advice that we must always measure the effectiveness of our policies by how they affect "the grand mother in Samfya looking after many orphans". Stellia Jere is typical of that Zambian woman doing all she can to make a difference in face of impossible odds. A week never passes without hearing something about China’s rising dominance. The eastern dragon is beginning to dominate international economic and political relations, and with that exposure comes greater global scrutiny. Everyone has an opinion about China’s place in the world. Is China colonising Africa? Will it initiate global disorder, like empires before it? Will the dragon implode and vanish causing wider global insecurity? These questions reflect not only the fear of change but also points to the fact that the rest of the world does not really understand China nor are we able to come up with the definitive answers about its future. Faced with such a vacuous knowledge the narrative about China’s place has largely been scripted by ignorant and an impatient media with little time to study the difficult questions. This has produced a rather unhelpful black and white juxtaposition. You either for China’s rise or against it. Mr Speaker, I thank you for allowing me to contribute to the debate on the President’s Speech which was delivered on the occasion of the Official Opening of the Fifth Session of the Tenth National Assembly....Sir, as mentioned in the President’s Speech to this House, mining will continue to contribute to the stability of our economy, job security of workers and for all Zambians to enjoy the prosperity this sector brings. In this regard, the mining sector still remains the main driver of the country’s economic development. The sector’s contribution to Gross Domestic Product (GDP) has been on the increase. It stood at 11 per cent in 2009 compared with 8.2 per cent in 2008 and 8.5 per cent in 2007 and contributes about 80 per cent to the country’s foreign exchange earnings. The target is for the mining sector to contribute in excess of 20 per cent to GDP. How will this be achieved? Madam Speaker, in my debate, I will concentrate on the mining sector because as the President said, it is the backbone of this nation....as regards the mining sector, on three occasions, the President, on page 11, spoke about increased production. He praised the Government on the increased production and claimed the glory. Madam Speaker, in the recent past, I have seen this phenomena of boasting about how Zambia’s copper production is increasing and that by the year 2011, our production levels will have gone back to the levels of the 1990s. Why are we boasting about this increased production? My colleague, the hon. Minister of Mines and Minerals Development has been boasting about how we are improving our production in the media. Whenever I hear that, I touch my head in embarrassment....This is because I wonder why we boast about production which is not ours. That money is not ours. The Chinese and Indians can boast, but not us. We have allowed 100 per cent externalisation of all the mineral proceeds. When it comes to tax, we have said, over and over again, that we are not gaining any benefits from the mines. I would strongly urge the hon. Minister of Finance and National Planning, whom I think is the right person to do this, to conduct a detailed social cost-benefit analysis of the taxation system of every dollar made on the copper that leaves this country or every dollar that comes into this country from the sale of copper. He needs to do this for our benefit, the benefit of the people of Zambia and in particular we, their representatives. We need to know how many ngwees or cents of that money is expended on the Zambian infrastructure, Zambian education system and the Government’s general revenue. What is our share of our own wealth as it goes out of the country, not in vague terms of a few thousand jobs here and there, but what are we actually getting as a country? Guy Scott echoing a point I have been making for sometime. When looking at the appropriate fiscal system for the mines one needs to adopt a "social" or "societal" approach. At present it is very much the case that mines are subsidised since they are free riders of social infrastructure. There's good reason why the government has never undertaken the sort of cost benefit analysis proposed by Mr Scott, it would be negative due to the gigantic revenue leakage from the system. We don't even need to do this for existing mines - a simple CBA for a new mining would also be negative. I have reviewed carefully all the Impact Assessments produced for the Environmental Council of Zambia, it is noticeable that not a single one does proper cost benefit analysis for a new investment. Now, I don't think that is because the ECZ is not aware of the need for thorough analysis or has no access to experts to quality assure the Impact Assessments submitted to them, its just that they don't care. The Zambia Revenue Authority has now started to publish aggregate statistical data on taxation and other issues. This is a good development, though the data needs to be more accessible in different formats (e.g. excel). It was painful just to put the chat below together - click to enlarge (real comparisons reveal very interest results - not shown below but will let others have a go). Hope it will be updated more regularly. In case you are having trouble locating the tax data. The link is above and can also be found here (at the bottom of the page you will see options e.g Taxation, GDP. Click on one of those). The International Budget Partnership yesterday released the Open Budget Survey 2010, the only independent, comparative, regular measure of budget transparency and accountability around the world. Produced every two years by independent experts, the report assesses which nations are failing to meet basic standards of transparency and accountability with national budgets. This opens the door to abuse and inappropriate and inefficient use of public money. 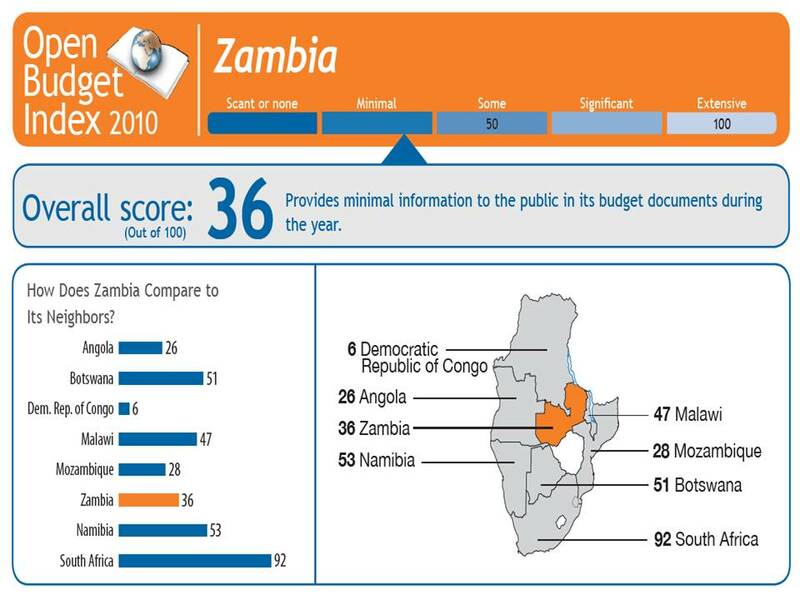 Yet another index highlighting Zambia's shoddy governance performance - Open Budget 2010 : Zambia Report. 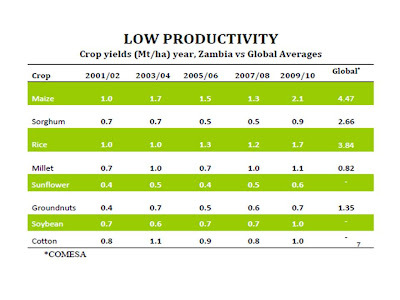 Another wonderful presentation from ACF/FSRP - Agricultural Productivity in Zambia: Has there been any Progress? Antony Chapoto. Presented to the Zambia National Farmers Union Congress (Mulungushi Conference Centre, Lusaka. 6 October, 2010). The extract below should wet your appetite! Zambia’s regulatory framework for its mining sector relies on co-operation, consultation, self-reporting and mutual accountability. Regulators are viewed as partners who should support and enable, as well as control and constrain, private sector interests, with the aim of creating ‘a win–win situation, so that when we regulate, we regulate such that they are more than willing and glad to comply’. 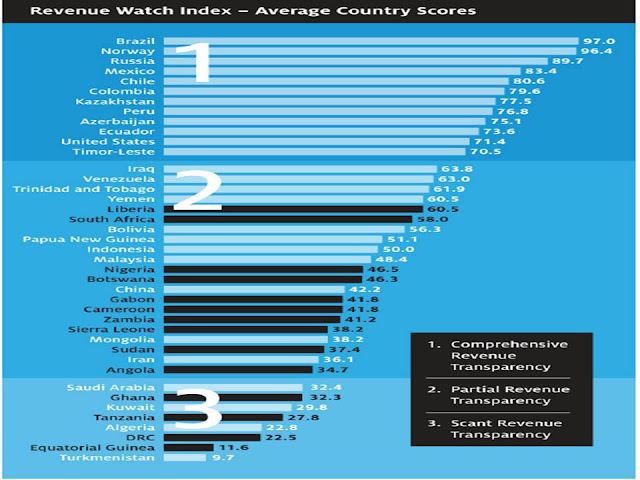 Revenue Watch Index is a pioneering measurement of government disclosure in the management of oil, gas and minerals, ranking transparency practices in 41 countries among the world's top producers of petroleum, gold, copper and diamonds. Created in partnership with Transparency International, the index is an assessment and comparison of information published by governments about revenues, contract terms and other key data. It looks to be an important tool all of us seeking increased public disclosure about natural resource management, and greater government accountability. Unsurprising, Zambia scores poorly - atleast we are better than Mongolia and Sudan. You can read the whole report here. In the last two weeks, I have been able to complete about three books. Those following on twitter usually pick up the tweets of the most interesting one-liners. There are two reviews which I'll soon make available. I am currently writing the review of The Beijing Consensus: How China's Authoritarian Model Will Dominate the 21st Century . This will be up next week. I recently, also penned a review for the Society of Business Economists - Daniel Dorling's Injustice : Why social inequality persists . Will make that available in due course. Alongside these two books, I also read an important book by Paul Miller - A Praying Life : Connecting with God in a Distracting World . This is one of the best books I have a read and a must read for Christians seeking a deeper communion with Christ. In a time when the material things like internet, blogs and other distractions seek to wrestle attention from Him, this book is an important contribution on how to return to the pursuit of God. It has been quite transformational and has come at the appointed time. One of the most important books I have read. One of the misleading statements we keep hearing from misguided voices within government is that all across the world governments are following Zambia's lead and reducing mining taxation. I can assure you that Zambia and Mongolia are in a league of two. The claim couldn't be further from the truth - precisely the opposite has happened. Below is the list of the actual developments regarding global mining taxation. These facts are all over the internet and you need not take my word. If people would stop being lazy they would not be so ignorant. Russia - Earlier this year it reintroduced a 5 percent duty on nickel exports from Jan. 1, 2010 after suspending the tax at the start of 2009 to support local miners during the crisis. It is now proposing to raise nickel and copper export duties to 10 percent as early as next month as it searches for new revenue sources to plug holes in the budge. Kasakhstan - Kazakh Prime Minister Karim Masimov in June said the resource-rich Central Asian state could reintroduce export duties on a range of raw materials. “Other than incompetence they just (government) don’t know the importance of taxation to development and in relation to poverty reduction-that’s all. They really don’t care for Zambia, they care for their Chinese, Indians and foreign investors-they don’t like Zambians. They are not working in the interest of the country for sure.....But you put it on record, that is why our country is not going to develop, it cannot develop on internal resources, our only internal resource is valuable and proper taxation of the mining industry, without proper taxation of mining companies, this country cannot develop and that is why it is not developing....So it is just foolish for this government to postpone development to our country by the unjust taxation system, whether its windfall tax or royalties what is important is that what we are collecting from the mining industry is not fair for the country..."
Dr Musokotwane explained that it is not possible to re-introduce the windfall tax on the mines as it is unreasonable....the finance Minister said that Zambians should not mislead themselves that there is no any other tax from the mines. He observed that most people think that without the windfall tax, Zambia is not receiving any other tax from the mines.....Dr Musokotwane stated that Zambia’s windfall tax was too high and unreasonable. He said that if Zambia introduces the windfall tax, it is likely to discourage investments in the mining sector in the end collapse it. I score this 1-0 to Mphande because the Minister's argument is hollow and I thoroughly debunk it on Eight reasons for rejecting higher mining taxes... The government needs fresh arguments. All the reasons they have put forward don't hold water. Since I wrote that piece I have yet to hear a single new argument by government and their pro-mining companies allies worth wasting additional intellectual capital on. As such the debunked reasons remains at eight. JP van der Merwe discusses the future of African banking and the opportunities it presents particularly to South Africa's big four banks – Standard Bank, Absa, Nedbank and FNB. Namibia recently inaugurated the first of its on-grid 250kW wood-to-electricity power plant that will generate electricity by burning wood chips. An interesting IRN brief of Mozambique's plethora of subsidies. Naturally the IMF and World Bank have been up in arms! Mail & Guardian asks whether Zambia is likely to emerge as the next bread basket. Among the highlighted signs includes an allegedly "influx of investors from Britain to South Africa have begun putting money into infrastructure development and transport". "Closer economic and diplomatic ties between China and Zimbabwe have had wide and far-reaching effects. Not only has Beijing been vetoing plans by the West and European capitals to take sterner action against Harare at the United Nations Security Council for her alleged human rights violations, but its capital has also come in handy for Zimbabwe. State-owned Chinese firms, supported by their powerful State apparatus and employing low-cost but efficient labour are not only outbidding contractors from other parts of the world for African projects, but are now controlling a formidable slice of telecommunications, textiles, construction and mining deals in Zimbabwe..."
You can read the whole assessment here. First there was a strange announcement that we have a new ambassador to Armenia (residence in Moscow) - one Mr Patrick Sinyinza (pictured on right enjoying a chat with Armenian President Serzh Sargsyan). According to the Armenian presidency, they apparently discussed "the importance of studying the potential of cooperation in different areas of economy and opportunities to develop these opportunities". In other words - nothing! Can someone please tell me why a cash strapped economy like Zambia needs an ambassador to Armenia? Why can't this post be a saving we make to deliver more ARVs or income support? "Mr. Speaker, 2010 has been an excellent year for copper exporting countries. The average price of copper on the international market has reached a record high of US $7,202 per metric tonne between January and September this year. Never before have prices consistently remained at such a high level. The outlook for copper prices continues to be bright for the remainder of the year, as well as for 2011"
The price trend of course is now above $8200 per metric tonne. Minister Musokotwane's figures are therefore a little more cautious, if not shortly out of date. 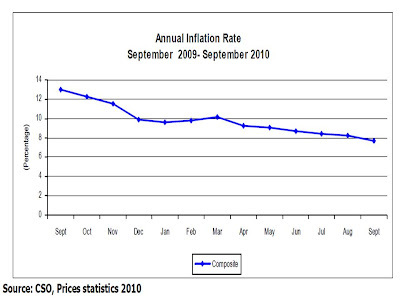 What is not out of date is the statement that "never before have prices consistently remained at such a high level". It is the price consistency argument and the fact that market analysts are all predicting that copper will breach $10,000 that makes Hon Musokwane's inexperienced decision now look like an act of day light robbery by the government against ordinary Zambians. The slump in prices for Africa’s natural resources, which led to chronic deficits in the past, has been reversed. Consumption, fueled by huge Asian demand for African commodities, is on the rise across the continent. 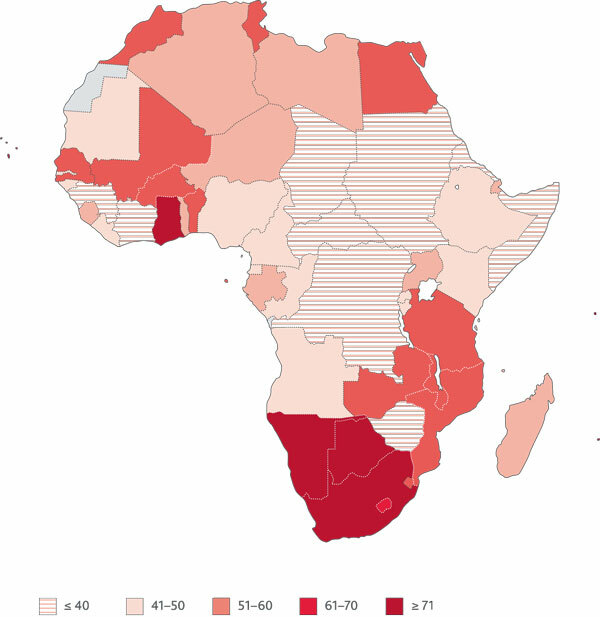 For much of Africa, this turn of events should mark a decisive break with endemic poverty. But, unless African leaders change their ways, it will not. Africa is estimated to hold more than 10% of global oil reserves and one-third of reserves of cobalt and base metals. South Africa alone possesses 40% of the world’s gold, which has been skyrocketing in value since the onset of the global financial crisis. Africa’s agricultural potential has barely been touched. From the Maximum Security section, your Committee toured the female section of Mukobeko Prison. Unlike the Maximum security section, the female section was slightly smaller and cleaner, although the prisoners were complaining of being underfed. Your Committee encountered about thirteen children whose mothers were being held as prisoners. Your Committee learnt that some of the children were born while their mothers were being held as prisoners while a number of them came with their mothers as infants. Your Committee urges the Government to ensure that the basic human rights of the prisoners should be observed at all times despite the prisoners’ current status....Your Committee is concerned with the psychological and social development of the children who are confined at the female section on account of their mothers’ incarceration. Your Committee earnestly appeals to the Government to have the children removed from the prison and be placed in a place where they can develop normally. It is said the quality of any society is judged by how well it treats those who are vulnerable. What sort of country locks up babies on account of their parents? It then proceeds to keep them there because apparently they have no where to go. We are not even talking about high quality jails, but crowded and poorly kept prisons with constant human rights violations. That is no place to bring up a child. I rarely get into activism or push readers into one direction - but it would be a dereliction of duty if I did not ask readers to make this a personal matter and lobby government accordingly. Zambia is better than this. Let us bring this injustice to an end. Please email government on this matter. In the absence of details of George Kunda (the minister responsible for prisons) email Dora Siliya. Irked by accusations that it is the new coloniser of Africa, China is looking to use soft power and historical evidence of its ancient links to the continent to justify its economic embrace of Africa. Chinese archaeologists have been sent to hunt for a long-lost shipwreck off the Kenya coast to support claims that China beat white explorers in discovering Africa. Meanwhile Beijing is preparing to fund more research on the continent to aid its companies and banks' quest for expansion there. Last month saw the launch of the new China-Africa Research Centre under the Ministry of Commerce. The centre's aim is to "provide a theoretical basis for the Chinese government's Africa-related decision-makings," Huo Jianguo, president of the Chinese Academy of International Trade and Economic Cooperation under the ministry said at the opening. It will also provide consultation services for companies with plans to expand their businesses to Africa, he added. You can read the rest of the IPS piece here. "Mike Muleba is a prisoner who was convicted on June 4, 2004 in the Kitwe High Court and appealed to the Supreme Court against his the verdict. Up until now, he has not appeared in the Supreme Court for his appeal....."
"In a related development of delayed cases in the Supreme Court sitting in Ndola, a man who seven years ago was convicted of aggravated robbery only appeared recently for his appeal. Moses Mulenga, 41, was jointly charged with Amon Banda for the murder of Major Kaunda and stealing his motor vehicle worth K80 million on November 3, 1999.....since then not much was heard of them until when the case suddenly resurfaced in Ndola this month. Mulenga together with Bandawere convicted of having robbedand killed Wezi Kaunda while armed with an AK-47 rifle and that during the act they used violence. The duo was sentenced to hang in 2003 after they were found guilty of the offence. It is clear from these proceedings that the duo had appealed to the Supreme Court asking it to review the earlier sentence imposed on them by the Lusaka High Court. It is common practice under the laws of Zambia that when one is sentenced, if not satisfied with the verdict, has every right to appeal to the High Court within a period of 21 days. But looking at the case of Banda and Mulenga, they were both convicted in 2003 and seven years has since elapsed after the judgment was passed only to have the appeal heard this year, September..."
Our courts are certainly crowded and the recent increase in judges was intended (if you ignore the political impetus) to help with appeals. But the article oversimplifies the problem and overlooks three complications. First, the congestion in the higher courts is largely driven by the congestion in the lower courts. One may argue that recent initiatives to increase court capacity at the magistrate level may actually lead to more congestion in higher courts as the volume of cases increase. It is not immediately obvious that we are likely to see a quicker resolution of appeals just because we have more high court or supreme court judges - if in effect the result is more volume of people in prison and generally seeking appeals from lower court decisions. There may be more higher court judges, but we can expect them to handle more cases, all things being equal because more people may join the court system as lower court capacity increase. Secondly, the source of the appeals are not inherently grounded in the volume of cases going through lower courts per se, but on how the congestion in lower courts affects the quality of justice administered in those lower courts which in turn may lead to more / fewer subsequent appeals in higher courts. At present it appears that there's always ground for appeal and nearly those who can afford to appeal find themselves always being able to overturn cases (I need to check though some statistics on this e.g. proportion of successful appeals). The reason is that at the lower courts judges are not only incompetent but tend to rush through cases. If the quality of cases in lower courts is largely affected by volume, then perhaps the recent increase in volume may well reduce the appeals. Alternatively if incompetence is the big problem then more court capacity simply means more incompetent lower court judges leading to even more appeals (and associated temporary injustice). Finally, it is too simplistic to simply say cases are delayed because we have fewer judges. This becomes obvious when we accept that justice in Zambia is rationed. There's a two tier system. The rich usually have their cases appealed quickly and are able to exhaust the system. The reason Mulenga and Muleba have struggled to get their cases repealed is probably the same reason they are incarcerated - they are poor people suffering from failed government policies. They have no access to the levers of power and the money that ensures they get proper legal representation. These are complicated but very fascinating issues. I am conscious of the need to return to them next year as part of our on-going series on "Rethinking Justice". The Finance Minister, Situmbeko Musokotwane MP delivered the Budget Statement today. Further analysis to follow, but a key change appears to be the reduction in donor contribution and greater reliance of borrowing - the government is planning to borrow nearly half a billion US dollars to add to its existing rising foreign debt. But I am sure there some election goodies there! Its one study over the weekend! The problem of illegal mining on the Copperbelt and Chingola town in particular has been quite persistent for some time. The town has huge mine dumps accumulated over years of mining. These dumps came about because sometime back, when technology was not as advanced, it was difficult to extract all the copper from the ore. But with improved technology, it is now possible to extract more copper from the ore lying as mine dumps. ZCCM then just dumped the ore from which they could not extract copper, thereby creating huge mountains of ore overtime. The dumps here belong to Konkola Copper Mines (KCM). These are the same dumps that have killed many people in the past. Because the illegal miners are not alive to safety matters, they carelessly did holes wherever they can in the dumps thereby compromising the base of these dumps. In an event of a downpour, the base is softened and this poses a risk of burying these illegal miners alive. Being alive to the dangers if this illegal mining is left unchecked, KCM in conjunction with Zambia Police have been trying to curb this problem. Just last week, they took a group of journalists to the mine dumps for them to appreciate the impunity with which illegal miners had been conducting their activities. The author focuses on the "illegal behaviour" of children but clearly the big problem is that mining companies have not lived up to their responsibility. In a separate para the author suggests "...because of limited manpower, KCM security cannot be everywhere at all times to police the mine dumps". This should not be condoned. The failure by KCM to address this disaster is at the heart of the problem - and this problem is affecting the lives of children. In face of poverty one is not surprised that children are being recruited in dangerous child labour. This is all due to the ecological genocide that the mines continue to perpetuate, of which this is just the latest reported manifestation. When KCM took over the mines it also purchased the obligations to safeguard the dumps. Government must do a better job to ensure these costs are properly internalised. Wasting the lives of our children and police resources to handle a problem that KCM should be sorting out is not a sound approach to governance. I have previously touched on the environmental problems on Mining Reflections - Proposition Two. Doreen Nawa is one of my favorite journalists. Always informative and without obvious political bias. She tells it like it is. A rare breed among government controlled journalists. You can follow her blog here. It brings together her many articles. One hopes other journalists will follow suit. Of course the easiest way is for the online papers to offer blog facilities to their journalists so its all in one place. 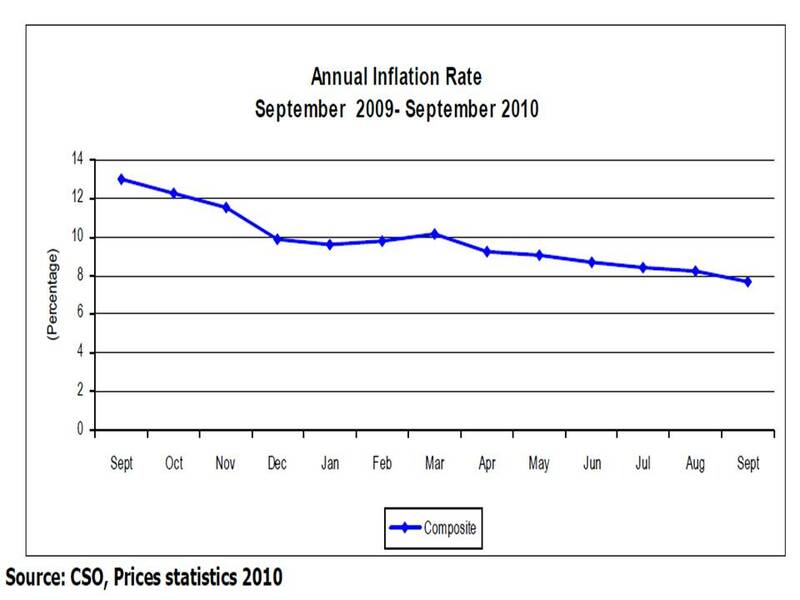 The annual rate of inflation, as measured by the all items Consumer Price Index (CPI), reduced to 7.7 percent in September, from 8.2 percent in August. The 0.5 percentage point reduction is attributed to the "reductions in the cost of some food and non-food items". More detail via the CSO Monthly Bulletin. It has been a while since we last checked on the copper prices. Another look make sad reading for our nation. It confirms the general upward trend - I believe it may not be too long before copper breaches the magic 10. We have of course long breached the copper price level at which President Mwanawasa introduced the windfall tax (in January 2008), with prices now above$8000 per tonne. The windfall tax was designed to match rises in the price of copper: it was set at 25 percent while copper sold for $2.50 per pound, 50 percent for the next 50 cents and increased to 75 percent when copper fetched above $3.50 per pound. The key important point is that we are now above the $3.50 per pound (the maximum marginal tax rate), and we are likely to remain above that threshold for sometime - at that price level Zambia would have earned a substantial windfall to invest money into serious poverty reduction and infrastructure development. I am not saying it would be paradise because the same incompetence that has removed the windfall taxation would have been administering revenue, but I am saying that we would be in a far better position than we are currently. Well you can now see who is laughing now - its certainly not the poor grandmother in Samfya with ten orphans to look after, thanks to the scourge of HIV/AIDs. I have previously addressed each argument marshaled against revising the windfall tax - see Eight reasons against higher mining taxes. I have still to hear any new cogent counter argument. The jury has truly rested. Our poor people are being robbed in broad day light. Who shall speak for them? I am sure there's a bemba proverb for this, though I cannot think of one right away! Well, sort of but its difficult to be sure. According to the latest Ibrahim Index Zambia has moved up just two places in the rankings. It has moved from position 18 in the 2009 index to position 16 in the 2010 index (2008/9 data). I'll leave the reader to compare the two sets of results and judge whether the improvement between 2007 and 2009 (from LPM to RB) represent a genuine / significant improvement or its within the margin of error or indeed others have simply got worse. My general view is that such comparisons are probably futile. The index is more useful as a comparator / benchmark across countries rather than as improvement over time. The graphic below compares the region picture in 2008/9 (the "redder" the better). It is therefore interesting to see that Zambia is no different from Tanzania or Mozambique, but better than Zimbabwe or Angola. That to me makes perfect sense. We are certainly no Namibia. No. According to this excellent report from the Council of Churches of Zambia. A key point made in that report is that "Zambia has no specific policy framework on uranium. Issues of uranium exploration/mining are only embedded in the Mineral resources development policy. However, the extra-ordinary characteristics of uranium require mining policies that are specific to it.....The absence of a policy on uranium may have led to some of the inherent weaknesses in the current legislation, resulting in inadequate attention to communities’ interests. Issues that indicate inadequate attention to communities’ interests include: Approval of an EPB report, which lacked assessment of socio-economic and environmental impacts. Drilling of exploration holes very close to people’s houses". There are a number of mining companies drilling uranium at present though some (e.g. Lumwana) claim they wont be in position to market uranium internationally until 2013/4. Read the whole thing below. Prosperity Unto Death: Is Zambia Ready for Uranium Mining? The latest ZIPPA report on "entreprenuership" is embedded below. We seem to be missing a ZIPPA report between July and September in our archives. The last report being here. I'll try and chase this up. To note also that in January ZIPPA will be focusing on the "controversial issue of Mines Taxation". Those who wish to write a short article should email the Editor : zippa@zippamail.com The journal is well read among Zambian policy-makers so be sure to get your short piece included - don't just be an "cyber critic" only - try and reach those who matter! One famous gym is situated right at the entrance of Chibolya and next to a mosque. The gym used to be called Pa Cigalu because of a huge dog that used to be found there. The huge canine died some time back, and the name slowly followed it to its grave. There is a police station situated on the eastern border of Chibolya and John Howard. The police station bears the township’s name, but the locals just call it “Pentagon”. The police, however, are clearly not welcome in Chibolya where they are treated as outlaws. There is even an invisible off-limit line for cops right at the mouth of Gaza Street. “We can’t go there in uniform,” one female police officer once told me. And the gangs do not hesitate in showing their indignation at the mere sight of a cop in uniform who over-steps the off-limit line. A glimpse from The Post's report on one of Zambia's forsaken compounds. Good journalism indeed from Monsieur Zimba - to tackle poverty, we must first bring it to the surface. You can read the whole thing here. An aerial view of the slum embedded below.